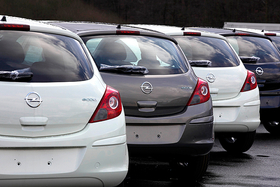 Opel Corsa models await shipment in Germany. GM's Opel unit helped European car sales rise 1.4 percent in year-on-year February figures. FRANKFURT (Bloomberg) -- New car registrations in Europe rose for the first time in 11 months as demand from consumers in Germany and France fueled sales at manufacturers including Volkswagen AG and General Motors Co.'s Opel unit. Registrations in the region advanced to 1.01 million vehicles in February, up 1.4 percent from a year earlier, the the European Automobile Manufacturers' Association said today in a statement. Sales by the VW group rose 9.1 percent, while Detroit-based GM sold 8.3 percent more cars. Fiat S.p.A., Ford Motor Co. and PSA/Peugeot-Citroen SA all lost sales compared with the same month in 2010, according to the statement. Demand in Germany and France, the two largest markets in the European Union, expanded 15 percent and 13 percent, respectively. New registrations fell 21 percent in Italy, 28 percent in Spain and 7.7 percent in the U.K, the Brussels-based association said. Fiat, Renault SA, PSA and VW are among carmakers who have been wooing customers with price cuts, cheaper financing or free options as government incentives expired during the economic recovery. State assistance has helped European manufacturers avoid factory closures on a scale seen in the U.S., leaving the industry with overcapacity across the region. VW, Europe's biggest carmaker, sold 226,126 units for a market share of 22 percent, including the Audi, Skoda and Seat brands. The carmaker aims to overtake Toyota Motor Corp. as the global number one by 2018. Renault, the carmaker that plans online sales of its Dacia vehicles, gained 3.1 percent to 113,342 cars. Its larger French peer PSA sold 141,894 vehicles, 5 percent fewer than the year before. Fiat, saw deliveries decline 17 percent to 76,808, including Lancia and Alfa Romeo cars. Opel, the GM brand aiming to return to profit this year excluding restructuring costs, surged 8.9 percent to 72,542 cars sold, while Chevrolet also increased registrations. Ford continued to shed market share as registrations dropped 12 percent to 73,133 vehicles. Stephen Odell, Ford's European chief, reiterated last month that the company prefers selling cars at a profit to gaining market share. Luxury carmakers, including Audi, BMW AG and Daimler AG's Mercedes-Benz cars, which didn't benefit as much from incentives targeted at smaller and more fuel-efficient cars, are aiming for record global sales this year. European registrations of Audi rose 15 percent last month, BMW excluding the Mini marque gained 13 percent, and Mercedes-Benz added 3.3 percent. Industry wide sales in the region fell to 13.8 million vehicles in 2010 from 16 million in 2007, the last year deliveries gained, according to figures from the carmakers' association, or ACEA. Headwinds for automakers this year include the rising price of steel, Daimler CEO Dieter Zetsche said on March 1 at the Geneva car show. An increase in the cost of oil may push buyers to shift to cars that use less fuel, BMW's chief Norbert Reithofer said a day earlier.